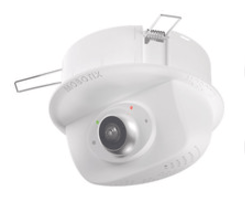 The Mobotix p26 Indoor Ceiling camera features a 6MP Moonlight sensor to be able to provide a good quality low-light image in every indoor environment. The P26 Mobotix Indoor Ceiling Camera features a 6MP Moonlight sensor to be able to provide a good quality of light performance in any indoor situation. The p26 is a ceiling camera with manual pan/tilt functionality guaranteeing that installation is easier. The p26 camera comes with a wide range of lens choices meaning you can have an angle of view between 15-180 degrees. The p26 is a very quick camera to install in a suspended ceiling as it can hold onto ceiling tiles by 3 spring clips. The p26 indoor camera can also replace up to four conventional CCTV cameras if placed correctly with the ultra-wide angle lens as it can record an entire space with no blind spots. The p26 camera is very time and cost efficient, due to the fact its simple to install as you only need 3 clips to be able to install it in a suspended ceiling. Its cost efficient if equipped with the hemispheric lens as if its placed in a single corner it can record the entire area with no blind-spots meaning you may need up to 3 less conventional 45 degree CCTV cameras.